Are you ready to meet the growing demand for more BSN-prepared nurses in health care? 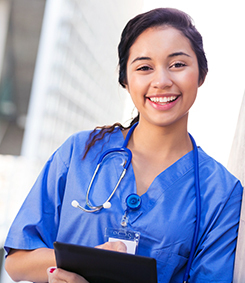 The UTRGV RN to BSN online degree program is designed to enable you to move ahead in your nursing career with leadership skills and knowledge from theory, research and evidence-based practice. Our RN to BSN online degree program is an affordable path to advance professionally in your nursing practice with the flexibility to continue working as an RN. Gain the evidence-based knowledge and management skills you need to take the lead while providing quality nursing care—all in a convenient, accelerated, online format. This course presents historical, philosophical, theoretical, sociocultural, economic, political, ethicolegal, and technological concepts impacting nursing and health care delivery systems (lay, folk, professional). This course introduces pharmacological concepts, nursing responsibilities, and use of the nursing process in medication therapy, including drug calculation and safe administration. This course presents a critical orientation to the research process, including various methods of inquiry, research evaluation for appropriate application to practice, and ethical considerations. This course incorporates anatomy, physiology, and assessment skills with psychosociocultural, developmental, spiritual, and ethicolegal considerations in client health assessment. Opportunities are provided in a simulated setting to practice cognitive, affective, and psychomotor skills and demonstrate systematic client assessment competency. This course addresses issues, trends, and problems in nursing as well as their impact on health care delivery systems (lay, folk, professional). This course addresses the community health nurse’s role and scope, utilizing the nursing process to plan and provide primary care to individuals and groups in a multidimensional community or rural setting, taking complex sociocultural, political, economic, health, and ethicolegal issues into consideration. This course addresses nursing leadership theories, organizational structures, health care management, transition from student-to-professional role, and the nursing process as it relates to leadership and management in clinical settings. Please review all the admission requirements for the Registered Nurse to Bachelor of Science in Nursing (RN to BSN) Online degree program. For specific questions or more details, contact an enrollment specialist at 1-833-887-4842. Be a registered nurse or have a temporary permit in your state.